Learn how to make this custom glass sign using an SVG file, your Cricut and a glass front picture frame. I have been wanting to make a glass sign for our home for a few years now. Actually, every since all saw the ones that say “Fresh Baked Pies Served Daily” like you can buy at World Market. Of course, I couldn’t simply BUY the sign. I had to make one, right?! 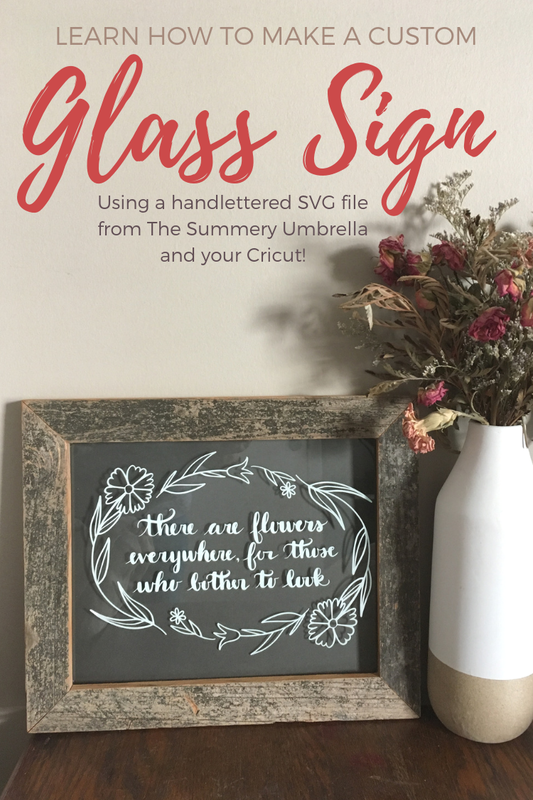 Well, today I’m over on The Summery Umbrella sharing a step-by-step, full of photos, tutorial on how to make a custom glass sign using this beautiful handlettered SVG file from LZ. I told you that I’d be sharing a creative idea each month on The Summery Umbrella here. I also told you what a great source The Summery Umbrella is for SVG files for your Cricut® machine. Well, LZ made this SVG design with her very artistic hands and I used the design in this glass frame. I think it turned out perfectly! Although, in hindsight, I maybe should have used black vinyl for my lettering instead of white. Why? Well, because I have the sign hanging in my bathroom and our walls are painted a light color, which makes the design a little harder to read. But, I had a simple solution. Any idea what it may have been? You can read all about it over on The Summery Umbrella. Plus, you’ll find this tutorial easy to follow because I’ve included pictures outlining every step. If you need additional help using your Cricut, you might want to read this post on how to convert a PDF file to a PNG format for use with your Cricut. This little file conversion tip will open up so many possibilities for you! So, what are you waiting for? Hop on over to The Summery Umbrella and be inspired! By the way, these custom glass signs make great gifts (Christmas presents???)! !